Animal producers point to the Canadian Codes of Care as proof of their concern for the welfare of farmed animals, but do they actually follow them? Preliminary results from a recent survey say no. The Codes of Care outline what industry considers best practices and although they are voluntary and inspections are not conducted for compliance, represent the best available protection for farmed animals as provincial and federal regulations exempt farmed animals along with any practice considered standard. The updated Code of Practice for the Care and Handling of Beef Cattle was released in 2013 and included the provision of pain relief as a “requirement” for all calves dehorned after January 1, 2016 and all calves castrated after January 1, 2018. 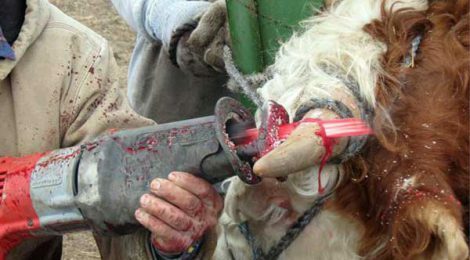 Dehorning is done by sawing the horn off as close to the skull as possible and causes such profuse bleeding that cauterization is sometimes required. Castration is done either by cutting out the testicles or cutting off the blood supply through the use of tight bands. Both procedures cause intense short and long term pain. The code’s requirement for pain relief at least acknowledged this and went some way to reduce animal suffering. The Western Canadian Cow Calf Survey was conducted between November, 2017 and February, 2018 and included 260 participants across the Prairies, with herd sizes ranging from 20 to 1,500 animals. Participants were compensated with up to $50 in gift cards and funding was provided by provincial ministries of agriculture and producer associations. Similar surveys were conducted in Ontario and Atlantic Canada but those results have yet to be released. Preliminary results of the survey were released at the Saskatchewan Stock Growers Association AGM last month. The full findings can be found here. The survey found that although required by the Codes, just 24% of producers actually use pain control during dehorning and just 28% use it during castration. So although the industry continues to trot out the Codes of Care in an effort to maintain social license, in practice, they’re little more than window dressing.